Your Hyundai is equipped with an automatic heating and cooling control system controlled by simply setting the desired temperature. Heating and Cooling Controls: 1. Temperature Control Switch. 2. Air Flow Control Switch. 3. Display Window. 4. Defroster Switch. 5. Blower Fan Control Switch. 6. AUTO (Automatic Control) Switch. 7. OFF Switch. 8. Air Conditioning Switch. 9. Air lntake Control Switch. 10. Air Quality System Switch (If installed). The FATC (Full Automatic Temperature Control) system automatically controls heating and cooling by doing as follows: 1. Push the "AUTO" button. The indicator light will illuminate confirming that the Face, Floor and/or Bi-Level modes as well as the blower speed and air conditioner will be controlled automatically. 2. Push the "TEMP" button to set the desired temperature. The temperature will increase to the maximum 90°F(32°C) by pushing the " " button. Each push of the button will cause the temperature to increase by 1°F(0.5°C). The temperature will decrease to the minimum 62°F(17°C) by pushing the " " button. Each push of the button will cause the temperature to decrease by 1°F(0.5°C). NOTE: o If the battery has been discharged or disconnected, the temperature mode will reset to Centigrade degrees. This is a normal condition and you can change the temperature mode from Centigrade to Farenheit as follows; Press the "TEMP" down button and "AUTO" button simultaneously for 3 secs. The display shows that the unit of temperature is adjusted to Centigrade or Fahrenheit. (°C→°F or °F→°C) o Never place anything covering the sensor which is located on the instrument panel to ensure better control of the heating and cooling system. The heating and cooling system can be controlled manually as well by pushing buttons other than the "AUTO" button. In this state, the system sequentially works according to the order of buttons selected. The function of the buttons which are not selected will be controlled automatically. Press the "AUTO" button in order to convert to automatic control of the system. The fan speed can be set to the desired speed by pressing the appropriate fan speed control button. The higher the fan speed is, the more air is delivered. Pressing the "OFF" button turns off the fan. This is used to select fresh outside air or recirculation inside air. To change the air intake control mode, (Fresh mode, Recirculation mode) push the control button. FRESH MODE ( ) : The indicator light on the button goes on when the air intake control is fresh mode. RECIRCULATION MODE ( ) : The indicator light on the button is illuminated when the air intake control is recirculation mode. With the "Fresh" mode selected, air enters the vehicle from the outside and is heated or cooled according to the function selected. With the "Recirculation" mode selected, and air from within the passenger compartment will be drawn through the heating system and heated or cooled according to the function selected. NOTE: It should be noted that prolonged operation of the heating system in "recirculation" mode will give rise to fogging of the windshield and side windows and the air within the passenger compartment will become stale. In addition, prolonged use of the air conditioning with the "Recirculation" mode selected may result in the air within the passenger compartment becoming excessively dry. This is used to select fresh outside air or recirculate inside air automatically. : OFF : ON Fresh Mode : Air enters the vehicle from the outside and is heated or cooled according to the function selected. Recirculation Mode : Air from within the passenger compartment will be drawn through the heating system and heated or cooled according to the function selected. 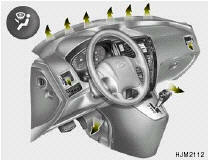 Exhaust Gas Cutoff Mode : Air enters the vehicle from the outside. But if exhaust gas enters the vehicle from the outside, the exhaust gas cutoff mode ( ) is automatically converted to the ( ) mode, to prevent exhaust gas from entering the vehicle. NOTE: It should be noted that prolonged operation of the heating system in recirculation mode ( ) will give rise to misting of the windshield and side windows and the air within the passenger compartment will become stale. In addition, prolonged use of the air conditioning with the recirculation mode ( ) selected may result in the air within the passenger compartment becoming excessively dry. CAUTION: If the windows fog up with the Recirculation or A.Q.S mode selected, set the air intake control to the Fresh air position or A.Q.S control to "OFF". 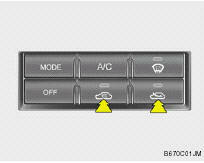 Press the "OFF" button to stop the operation of the heating and cooling system. This is used to direct the flow of air. Air can be directed to the floor, dashboard outlets, or windshield. Four symbols are used to represent Face, Bi-Level, Floor and Floor-Defrost air position. When selecting the "Face" mode, the indicator light will come on, causing air to be discharged through the face level vents. When selecting the "Bi-Level" mode, the indicator light will come on and the air will be discharged through the face vents and the floor vents. When selecting the "Floor-Level" mode, the indicator light will come on and the air will be discharged through the floor vents, windshield defroster nozzle, side defroster nozzle and side ventilator. When selecting the "Floor-Defrost" mode, the indicator light will come on and the air will be discharged through the windshield defrost vents, the floor vents and side defroster nozzle and side ventilator . When the "Defrost" button is pressed, the ( ) mode will be automatically selected and the air will be discharged through the windshield defrost nozzle, side defroster nozzle and side ventilator. To assist in defrosting, the air conditioning will operate if ambient temperature is higher than 2°C, and automatically turns off if the ambient temperature drops below 2°C.